We’ve all seen a movie or TV show that got our imagination going, and the more studious of us might get fired up over a good book (one without pictures, even). You never know were inspiration might come from, which is why it’s so hard to track down in the first place. But one place we don’t often hear about providing many hackers with project ideas is the grocery store. But of course the more we learn about [Michael Kohn], the more we realize he’s got a very unique vision. On a recent trip to the grocery store, [Michael] saw a two pack of frozen lobsters and thought they would make fine battling robots. You know, as one does. Unfortunately the process of taking a frozen lobster and turning it into a combat droid (which incidentally does include eating the thing at some point in the timeline) ended up being so disgusting that he only finished one of them. Whether that makes this poor fellow the winner or loser though…that’s a question that will require some contemplation. The first step was cooking and eating the beast, and after that came cleaning the shell of as much remaining meat and innards as possible. He then baked it in a toaster oven for 40 minutes and let it sit for a couple of days to make sure it didn’t have any residual smell. Once he confirmed the shell was clean, he glued it back together and got started on mounting it to his hardware. 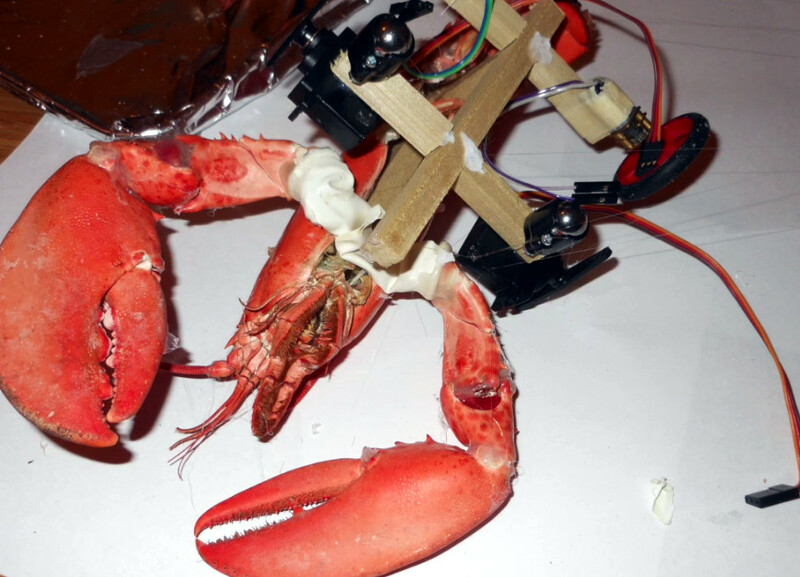 A wooden frame under the lobster holds the dual HD-1711MG mini servos that power the karate chop action of the claws, as well as the electronics. [Michael] used a ATtiny85 and NTD4963N MOSFETs to make a basic RC platform which responds to IR from a Syma S107 toy helicopter controller. He tried to power everything with AAA and then AA batteries, but found they just didn’t give him the juice he needed once the bot got going. So the final version utilizes a 5 V regulator and a standard RC 7.2v LiPO battery pack. If you’re not big on shellfish, never fear. He’s created similar roving contraptions based around sausages and carrots too. One could say he’s truly a man of refined…taste. With the radio control hobby arguably larger now than it ever has been in the past, there’s a growing demand for high-fidelity PC simulators. Whether you want to be able to “fly” when it’s raining out or you just want to practice your moves before taking that expensive quadcopter up for real, a good simulator on your computer is the next best thing. But the simulator won’t do you much good if it doesn’t feel the same; you really need to hook your normal RC transmitter up to the computer for the best experience. [Patricio] writes in to share with us his simple hack for interfacing his RC hardware to his computer over USB. Rather than plugging the transmitter into the computer, his approach allows the receiver to mimic a USB joystick. Not only is this more convenient since you can use the simulator without wires, but it will make sure that the minutiae of your radio hardware (such as response lag) is represented in the simulation. The setup is actually very simple. [Patricio] used the ATtiny85 based Digispark development board because it’s what he had on hand, but the principle would be the same on other microcontrollers. Simply connect the various channels from the RC receiver to the digital input pins. RC receivers are 5 VDC and draw very little current, so it’s even possible to power the whole arrangement from the USB port. On the software side, the Arduino sketch does about what you expect. It loops through listening for PWM signals on the input pins, and maps that to USB joystick position information. 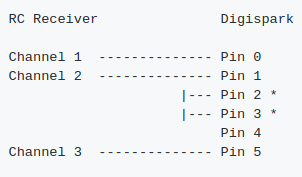 The current code only supports three channels for a simple airplane setup (X and Y for joystick, plus throttle), but it should be easy enough to follow along and add more channels if you needed them for more complex aircraft. For more information on the intricacies of RC transmitter and receiver interaction, check out this fascinating research on receiver latency. 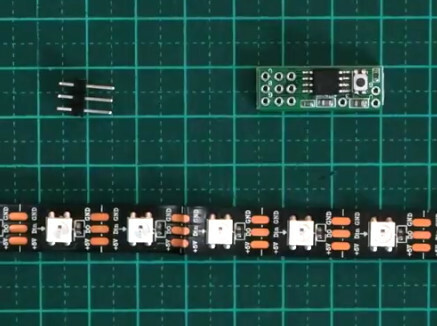 Every scrap of power is precious when it comes to power harvesting, and working with such designs usually means getting cozy with a microcontroller’s low-power tricks and sleep modes. But in the case of the Ultra Low Power Energy Harvester design by [bobricius], the attached microcontroller doesn’t need to worry about managing power at all — as long as it can finish its job fast enough. The idea is to use solar energy to fill a capacitor, then turn on the microcontroller and let it run normally until the power runs out. As a result, a microcontroller may only have a runtime in the range of dozens of microseconds, but that’s just fine if it’s enough time to, for example, read a sensor and transmit a packet. In early tests, [bobricius] was able to reliably transmit a 16-bit value wirelessly every 30 minutes using a small array of photodiodes as the power supply. That’s the other interesting thing; [bobricius] uses an array of BPW34 photodiodes to gather solar power. The datasheet describes them as silicon photodiodes, but they can be effectively used as tiny plastic-enclosed solar cells. They are readily available and can be arranged in a variety of configurations, while also being fairly durable. Charging a capacitor then running a load for a short amount of time is one of the simplest ways to manage solar energy, and it requires no unusual components or fancy charge controllers. As long as the load doesn’t mind a short runtime, it can be an effective way to turn even indoor light into a figuratively free power source. What makes a game a game? Like, how do we know that we’re looking at a variation of PONG when confronted with one? And how do we know how to play it? [Bertho] sought to answer this question as he designed what is probably the smallest-ever 1-D PONG game. His answer involves charlieplexing LEDs, using a voltage divider to save I/O pins, and a couple of AAAs that should last for a long, long time. [Bertho]’s Minimum 1-D PONG, or m1dp for short, puts an ATTiny85 through its paces as gameplay quickly progresses from ‘I got this’ to ‘no one could possibly keep this up’. This state machine sleeps until one of the two buttons is pressed, at which time a wait animation starts. The action begins with the next button press. Game play across only five LEDs makes for some pretty intense action, too. Fortunately, the buzzer is a big part of the experience. It sounds one tone for each LED when the ball is in play, and a different tone to confirm button presses. [Bertho] saved so many I/O pins with charlieplexing that he added a green LED that lights up when it’s OK to return the ball. If we were playing, we’d keep our eye on this LED instead of trying to watch the ball. We’re serving the demo after the break point, so don’t let it get past you. For a study in minimalism, there sure is a lot going on here with all the different tones and animations. If you’d prefer maximalist 1-D PONG, there’s always LED strips. If dungeon crawlers with satisfying hardware are more your thing, you really need to check out Twang.